Molise, pronounced [moˈliːze] is a region of Southern Italy. 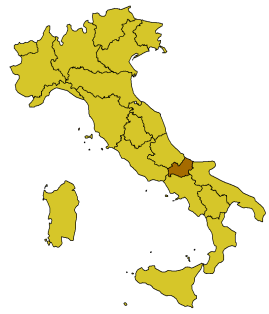 Until 1963, it formed part of the region of Abruzzi e Molise, alongside the region of Abruzzo. The split, which did not become effective until 1970, makes Molise the newest region in Italy. The region is split into two provinces, named after their respective capitals Isernia and Campobasso. Campobasso also serves as the regional capital. Molise has a short coastline to the northeast, lying on the Adriatic Sea. Though there is a large Fiatplant (Termoli), the industrial sector is dominated by the construction industry with small and medium-sized farms spread widely throughout the region. Another important industry is food processing: pasta, meat, milk products, oil and wine are the traditional products of the region. Agriculture, involving small and micro holdings, is currently offering high-quality products. The agricultural holdings produce wine, cereals, olive oil, vegetables, fruits and dairy products. Traditional products are Grass Pea (cicerchia)andFarro. International tourism is becoming more evident largely as a result of the international flights from other European states, Great Britain, and North America which enter Pescara not far to the north in Abruzzo. The tourists are attracted by large expanses of unspoilt beaches, a relative lack of congestion, and the gentle pace of life. The cuisine of Molise is similar to the cuisine of Abruzzo, though there are some differences in the dishes and ingredients. The flavours of Molise are dominated by the many aromatic herbs that grow there. Some of the characteristic foods include spicy salami, a variety of locally produced cheeses, dishes using lamb or goat, pasta dishes with hearty sauces, and vegetables that grow in the region. In addition to bruschetta, a typical antipasto will consist of any of several meat dishes, such as the sausages Capocolli, the fennel-seasoned Salsiccie al finocchio, Soppressata, ventricina, frascateglie or sanguinaccio. In addition to these sausages, a variety of ham is available, such as smoked prosciutto. Frequently, the sausages are enjoyed with polenta. Fish dishes include red mullet soup, and spaghetti with cuttlefish. Trout from the Biferno river is notable for its flavour, and is cooked with a simple but tasty sauce of aromatic herbs. And finally Zuppa di pesce, a fish stew, a specialty of Termoli.